Home » Featured » Is Your Kava GMP Kava? We’ve always felt that assurance of quality was of the utmost for our treasured and loyal customers. As part of that commitment to quality, Kona Kava Farm became a GMP (Good Manufacturing Practices) compliant company from the farm to your table several years ago as the new, far stricter rules came into being for small businesses in 2011. What does GMP do for you? It assures a minimum of quality in all of your dietary supplements, as any manufacturer, distributor, and retailer has to agree to follow a very strict set of procedures for all aspects of providing you with the Kava products you love. In fact, GMP procedures are the very manufacturing procedures that pharmaceutical manufacturers have to follow. This includes extremely strict standards down to the amount and type of particles in the air of a clean room where products are actually manufactured. We start by testing every single harvest of Kava that comes out of the ground for contaminants, pathogens, metals, and bacteria. This is done in a certified testing facility such as Chromadex; specialists in testing raw materials and finished goods for all kinds of industries. We then re-test that product when it arrives at our USA holding facility, where it remains in quarantine until the lab confirms it’s safe for release. It’s here where we do all of our extra testing, including Total Kavalactone Content and Kavalactone Lineup of each and every one of our Kava products. When we say that our Kavalactone 30% Capsules are a very “happy” 2-4-6 lineup, it’s not a guess. It’s because we know exactly what the lineup is, from 1-6, as well as the exact Kavalactone percentage. Our Kavalactone 30% Capsules are actually manufactured from Kavalactone 33% Powder, but we always underestimate to ensure our customers are never disappointed with the quality of the products they receive. Once the Kava root is released from the initial holding facility, that’s when the fun begins! 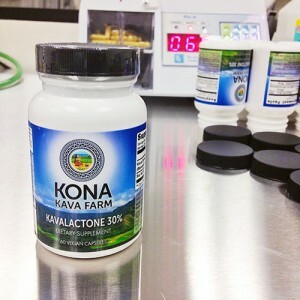 That’s when it gets portioned out for the manufacturer into Kavalactone 70% oil, which then gets crafted into several Kona Kava Farm products, including our Kavalactone 55% Paste, and our Full Spectrum 55% Paste; two of our All-Time Top Selling products here at Kona Kava Farm. Or, it’s made into our Kavalactone 33% Powder that turns into Instant Drink Mixes, capsules, and other products. Mind you, every step of this process is carried out in a GMP Manufacturing facility, ensuring safety and transparency in the process that is painstakingly documented and traced every step of the way. Down to the sterility of the product, anything that touches the product (never human hands! ), to the packages they’re placed in and even the bands used to heat seal each product for your protection; Kona Kava Farm has taken the time and expense to ensure you get a consistent, quality, legal product that contains the exact dosages that are spelled out on each and every label for each and every product. And here’s an easy test to know if your Kava is manufactured in an FDA-compliant GMP facility; does it have Supplement Facts on the back? Does it clearly list the contents of the package? Does the package give you contact information regarding who to call in case of issue or emergency? Does it contain less than 290mg of Kavalactone per serving (hopefully much less), and 290mg of Kavalactone per a total daily total intake of Kava? Is there an Expiration or a Best By date on the package, so you know when it needs to be used up by? Do you know if your Kava ever gets tested; at the farm, when it arrives at your supplier’s facility, and again, before it goes out the door to you? Do you know if your Kava has safe levels of any metals? Bacteria? Are you certain there are no pathogens in it? You do when you purchase Kava from us, and you have for several years now. We feel like we’ve been ahead of the curve by voluntarily adhering to strict GMP standards when they first came into effect. We’re not playing catch up now like others may be doing. We’ve become experts at compliance, and ensuring safety, quality, and FDA-compliant products is built into the very fabric of what we do. We don’t have to think about it because we wouldn’t know how to manufacture Kava any other way. Even the Fulfillment Centers, whether it’s our Chicago facility or our California facility, are completely FDA-compliant in their operations, working with a full set of SOP’s that have been built from the ground up from over 12 years of offering Kava to our customers around the world. This means that the Kava products you receive have been stored in a temperature, light, and humidity-controlled environment, that has to meet very specific conditions over an extended period of time. Can your Kava boast that? Rarely do we ever toot our own horns or make a point of the level of care and quality that goes into our products, but every once in a while we feel it might be helpful to remind our treasured customers how much we do care about the products we provide them, products that we feel are on a level unmatched by any other Kava supplier in the industry at any price. Our level of commitment to our customers often happens behind the scenes, and it can be a thankless task sometimes. But we love Kava, we love sharing it, and we love finding the happiest cultivars to share with you.